CUTTING BOARD IS 16" X 24"
With an efficient heating lamp designed to keep food hot, and a drip pan inset under the cutting board to collect scraps and drippings, this Cres Cor model is the ideal carving station for caterers, banquet halls, hotels and rental companies. * Portable adjustable infra red warmer with Richlite wood fiber cutting board. 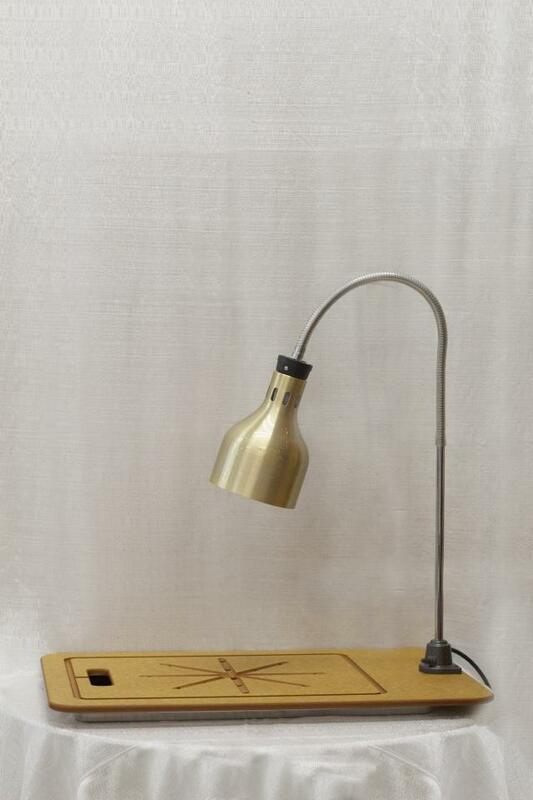 * Flexible arm's tension keeps lamp in position once adjusted. * Supplied with shatter resistant and thermal shock resistant 250 Watt red lamp (120 Volts). * On-Off switch mounted on base for convenience. * Please call us with any questions about our cutting board w/heat lamp serving Cary NC and Raleigh NC, Chapel Hill, Pittsboro, RTC & Raleigh-Durham in North Carolina.